If you're a fan of competitive eating, then you will not want to miss this year’s Giant Pumpkin Festival at the Elk Grove Regional Park. 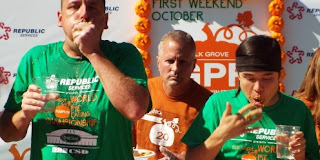 year's pumpkin pie eating contest in Elk Grove? The annual event hosted by the Cosumnes Community Service District will feature among numerous events and activities, including a Major League Eating fully-sanctioned pie-eating contest featuring internationally renown competitive eater and currently second ranked Joey “Jaw” Chestnut. A topped ranked competitive eater, the Vallejo-based Chestnut was runner-up won in last year’s inaugural pumpkin pie eating contest barely being edged out by San Jose’s Matt “The Megatoad” Stonie. Other events at the two day festival that starts on Saturday October, 3 includes a pumpkin and produce weigh-off contest, sweet and savory contest, and a host of other family friendly-activities and contest. Admission to the festival is free and parking inside the park is $10. A portion of festival proceeds benefit local youth and service organizations. Watch "The Megatoad" crush a burrito in the video below.